Paul Binski: The Coronation of the Virgin on the Hastings Brass at Elsing, Norfolk. Examines the role of the image of St George – a fashionable Windsor-based cult. Discusses other 14C tombs with Marian imagery. The brass’s images are all derived from Continental models. Examines particularly the Coronation of BVM images which use perspective otherwise absent on rest of brass. Suggests connection with paintings of Jean Pucelle active in Paris in 1320s. Shows Pucellian originals influencing style in other media. 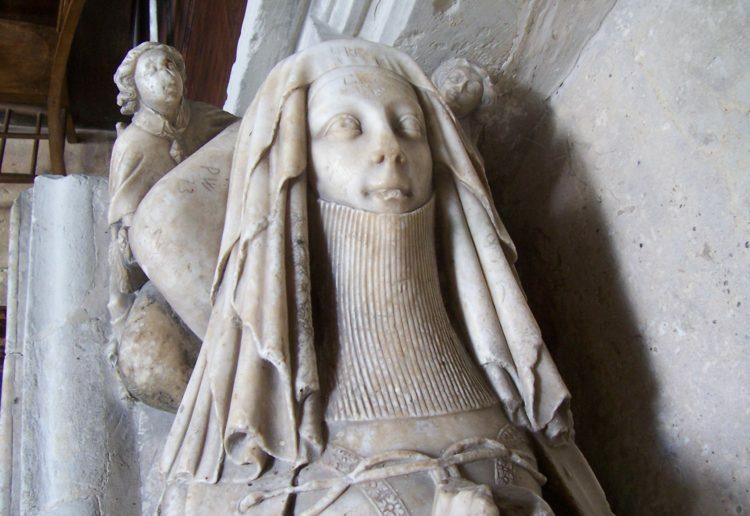 A.V.B.Norman: Two Early Fourteenth Century Military Effigies. Discusses military brasses at Stoke D’Abernon and their revised dating. Describes the armour on the effigy of Sir Henry de Cobham d. c.1316 at Shorne, Kent and Sir Richard de Westcote d. 1333 at Binsted, Hants. Comments on the nature of the armour particularly the coifs worn by these effigies, their sword belts and spurs. Adam White: Classical Learning and the Early Stuart Renaissance. Early 17C memorial sculpture saw introduction of classical learning in design. Pattern of patronage changed, key monument is Elizabeth Russell d. 1600 in Westminster Abbey. Her seated effigy is placed on a copy of a Roman sepulchral altar published in 1602 – probably by Cure workshop of Southwark. Design possibly influenced by her mother Lady Russell who was familiar with recent continental innovations. Also discusses monument to Francis Holles by Nicholas Stone 1624-7 in Westminster Abbey. Traces Inigo Jones monumental work and his influence on Stone. Discusses William Camden’s d. 1623 monument in Westminster Abbey. Suggests Inigo Jones’ classicism not understood by Stone so soon died out. Tessa Murdoch: Roubiliac’s Monuments to Bishop Hough and the Second Duke and Duchess of Montagu. Discusses monument of John Hough, Bishop of Worcester d. 1743 in Worcester Cathedral. Also monument to Duke of Argyll and Greenwich installed in Westminster Abbey in 1749. 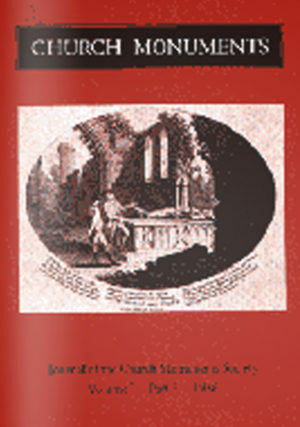 The monuments of to the Duke and Duchess of Argyll at Warkton, Northants 1753-4 and to the Viscount and Viscountess Shannon at Walton on Thames c.1755 and George Lynn at Southwick, Northants 1759-60 are also considered. Julius Bryant: The Church Memorials of Thomas Banks. Discusses, among others, monuments to Isaac Watts 1779 at Westminster Abbey, Bishop Newton at St Mary le Bow d.1782, Sir Eyre Coote at Westminster Abbey 1783-9, Anne Martha Hand at St Giles Cripplegate d.1784, Anne Pakenham at Meath, Eire 1791. Suggests Banks saw memorial sculpture as the medium by which he could produce work of gallery quality for which his training in Rome had prepared him.